When I think of everything that needs a good tidy I sometimes find it overwhelming. It is however, something that needs to be done, otherwise the clutter can become overwhelming itself. Time to tidy up! I have created this list both to inspire me and to keep me motivated. (I plan to do a lot of ticking off in the next few months). My word of the year is ‘detail’ and this is the type of detail I am starting with. My bedside locker is generally packed full of all sorts of things that I think I might need – tissues, mobile phone, chargers, water, books that I am reading/want to read/ have already read, hair ties, hair brushes – you get the idea. I even have some cute coasters for tea in bed. The only problem is that I can’t always find place for the tea. This is the first area to be hit! Housewarming cards which get replaced by Christmas cards etc. When this get’s tidied I will save a spot for one Valentine’s card – but that is it. I actually quite like to change the decorations on my mantle piece as it really is an area that draws focus. My plan is one candle and a few key items. The clutter of incense, oil burners, matches and random bits and pieces will be banished. I think I seriously need a coat rack, perhaps with a shelf. Perhaps a few more tidy tools. A place for everything from mail, gloves and hats, and keys. A good idea for me would be a waste bin – right at the door for junk mail, envelopes and the zillions of slips that seem to multiply in my handbag. I tend to use my windowsills for storage, especially books. I am short of storage space in my home, but I do think that perhaps limiting what is allowed on the windowsills might be a good thing. I love make-up and am can’t resist it. I seem to have make-up clutter everywhere from make-up bags to the bathroom cupboard. It does tend to multiply and I think a cull and a clean-up is on order. This might have to be a monthly task. Hands up who has empty shampoo and shower gel bottles. Please tell me it isn’t only me? This is a quick clean out, but should make a big difference. I will limit myself to one shampoo, one shower gel, one conditioner and my two scrubs. Enough I think! We all have one – quite often in the kitchen. The one that gets filled with miscellaneous keys of unknown origin, pens that no longer write, scraps of paper that were important at one time, business cards – you get the idea. A simple blitz with a bin. With so much happening online it is important to keep record of some things in the old-fashioned way. A good friend advised me to set aside an hour or two a week for important financial things – very good advice. I have added filing to this time slot. A little behind right now, but yet another thing that can be ticked off. It is so satisfying seeing the linen cupboard all neat with bedding sets paired up and cosy towels in a pile waiting to be used. Alas it only takes one morning when you need a towel from the bottom of the pile and it all comes tumbling down. Now, I know that not everyone had a craft room, but if you do it is a big job. My craft room is also my study and it is chaotic. It is at the bottom of this list as it is such a big job, but it must be done. I hope these tips might inspire you. 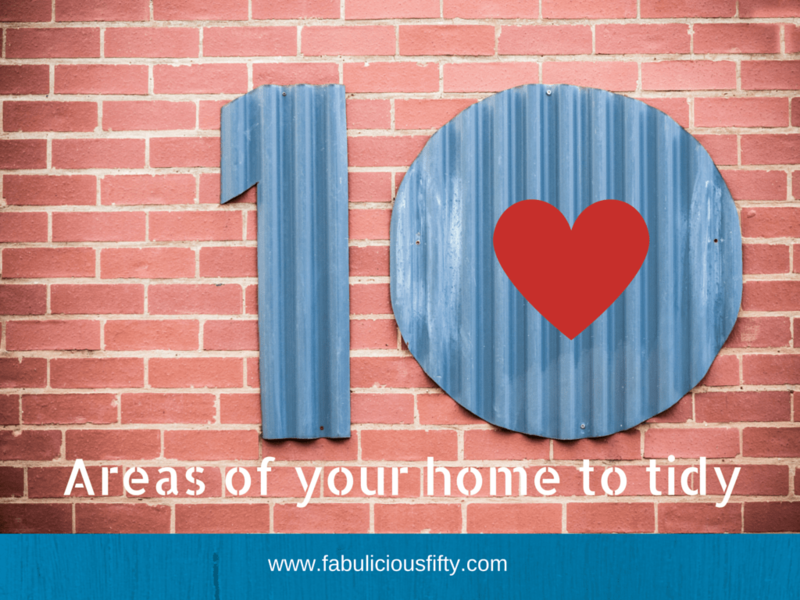 Any other areas of the home you would like to add to the list? Thanks for reading and I appreciate any suggestions! Read more about my word ‘detail’ – here. What a nice list. I need to clean the same 10 areas! I am sure I have a few more that need tidying but that is a start! Thanks for commenting.